15-Feb-2019 Thai Beverage - 1QFY9/19 Results Review ~ Volumes Up! 18-Jan-2019 Thai Beverage - BUY; Bottoms Up! Thai Beverage Public Company Limited, together with its subsidiaries, produces and distributes alcoholic and non-alcoholic beverages, and food products in Thailand and internationally. The company operates through four segments: Spirits, Beer, Non-Alcoholic Beverages, and Food. It offers liquor and beer products; spirits, including brown spirits, white spirits, herbs, and other products; and non-alcoholic beverages comprising drinking and soda water, electrolyte beverages, energy drinks, green and herbal tea, ready-to-drink coffee, carbonated soft drinks, isotonics, soya drinks, Asian and sparkling drinks, coconut water, cordials, pasteurized milk, UHT milk, sterilized milk, yoghurt, canned milk, pasteurized juice, ready-to-drink juice, ice cream, and cereal bars. The company also provides chilled and frozen food products, and snack products; and oak barrels, light construction bricks, fertilizers, animal feed and supplementary animal feed, etc. In addition, it engages in the operation of Japanese restaurants, bakeries, and social enterprise; production and distribution of biogas; trading of molasses; and the provision of advertising agency, marketing, training, consultancy, asset and brands management, transportation and distribution, procurement, and human resources and organization development services. Further, the company is involved in the trading of bottles and supplies; and production of plastic packaging and related businesses. It primarily sells its products under the Ruang Khao, Hong Thong, Blend 285, Chang, est, Oishi, 100PLUS, Old Pulteney, anCnoc, Caorunn, Blend 285 Signature, Ruang Khao Silver, Crystal, and Federbräu brand names. Thai Beverage Public Company Limited was founded in 2003 and is based in Bangkok, Thailand. barca Bounce off again from 0.59 on 1st July. TomYam ThaiBev: Will It Resume Mid-Term Uptrend? From the weekly chart, we can see that ThaiBev is still in an uptrend. While the stock dropped for the past two to three weeks following a severe drop in Straits Times Index (STI), ThaiBev is still considered relatively strong compared to STI given that it is a component stock and did not drop much recently. 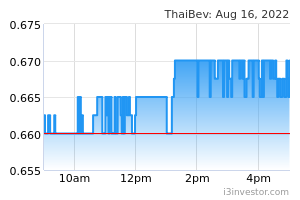 Notably, when most of the blue chips dropped yesterday, ThaiBev did not make a new low, signifying signs of strength. The STI dropped 80 points yesterday and it is likely to have another round of panic selling this morning. However, the stock may have a short-term rebound in the next few days or even before today’s market close. ThaiBev may rebound stronger than STI and likely to resume mid-term uptrend in the next few weeks. One may consider buying on breakout for this stock. The stop loss will be one bid below the recent low. TomYam Standard Chartered Bank issued report on July 5th with target price of 0.75cents. tsl123 What happen? Sudden drop today. grace2 downgrade by USB to 0.51.
john_ric analyst are not gods. they just guesstimate. ubs analyst has a .51 sgd TP. Looking at the recent down trend of thaibev, he may be right. Also based on the chart, thaibev is oversold and may be rebound any time now. clarence_yeo2003 analyst call usually post target price for one year timeframe so it may go up to 0.8 in 1 year time coz they are long term investor perspective. 11259jas Any advice on this counter? barca Nirgunan who has a “buy” call and price target of 75 cents......???? With growing regional consumer demand as the backdrop, Thai Beverage, the leading maker of drinks from white spirits to green tea, has been rated favourably by analysts for its strong base and growth potential. Last year, the company is estimated to have cornered more than three quarters of the spirit and one third of the beer sales respectively in its home market. ThaiBev's successful bid for control of Singapore-based drinks and property company Fraser & Neave with the help of TCC Assets, the investment holding company owned by ThaiBev chairman Charoen Sirivadhanabhakdi, also made the company a larger and stronger regional player in the F&B field. This is the reason why, from the start of the year till July 17, all five recommendations of ThaiBev had either been "buy" or "overweight", with target prices ranging from 75 to 80 cents. However, in a contrarian call made on July 18, UBS Investment Research analyst Chirag Saglani figured that ThaiBev, which closed 0.5 cents lower at 56 cents on July 19, is worth only 51 cents, because of a looming downturn in Thai consumer sentiment and possible risks in the restructuring process of F&N. For one, spirits, which accounted for 58% of the company's revenue and a bigger proportion of its earnings in FY2012, could see weakening demand from the main customer segment of lower income workers. "Rising household debt and government tightening of populist subsidy schemes is likely to affect purchasing power," writes Saglani, referring to the government's decision to lower the minimum guaranteed price of rice from 15,000 baht per tonne to 13,000 baht per tonne from November. Then there was also the excise duty hike last year that made alcohol more expensive. And prices of soft commodities like rubber and palm oil produced by Thai small holdings have also softened. With incomes affected, demand will shift from ThaiBev's relatively premium products to cheaper alternatives, says Saglani. As such, he predicts that ThaiBev's sale of spirits will drop 5% by volume this year and remain flat in 2014. UBS estimates that ThaiBev, trading at 19 times 2013 P/E, is going to post an underlying earnings compounded annual growth of just 5.3% for FY2012 to FY2015 and believes "valuation is expensive" for the stock. Then there is the looming restructuring of F&N's property, publishing and beverage businesses by the new owners. Saglani believes ThaiBev might have to cut its dividend payout ratio to 40%, from the current 50%, as it tries to pay down $3.3 billion in debt incurred from the acquisition. The restructuring could involve some kind of swap between ThaiBev, which owns 28.6% of F&N, and TCC Assets, which owns 61.4%. Saglani believes ThaiBev would sell its share of the non-beverage business to TCC Assets, and TCC Assets, in turn, would sell its share in the beverage business to ThaiBev. The net effect would result in ThaiBev and TCC Assets owning both 90% each in the beverages, and non-beverages business, respectively. However, the key risk for ThaiBev shareholders is: At what value would the different businesses change hands? Under the first of two scenarios floated by Saglani, both the property and publishing business would be transacted at book value. This would result in TCC Assets paying ThaiBev $475 million. The second scenario involves the possibility of the property business transacted at 0.7 times book and publishing at 0.8 times book. This would result in ThaiBev paying TCC Assets $839 million. The total of $1.3 billion from these two scenarios is worth 5 cents per share, or 10% of the price target, calculates Saglani. There is also a third scenario. "It is also possible that it completely divests the stake in the publishing business to a third party," writes Saglani. In an announcement by F&N on July 18, the company states that TCC Assets, because of "unfavourable" market conditions, has not sold enough shares to increase the free float above the 10% level. On July 19, SGX agreed to give F&N an extension till end of the year for a more thorough review on what to do next. Nevertheless, there are analysts who are more optimistic than Saglani. Nirgunan Tiruchelvam of Standard Chartered, in a July 5 note, believes that ThaiBev will unleash 8 billion baht ($326 million) worth of synergy when F&N's drinks business is consolidated within the company. In this scenario, ThaiBev would be trading at 16.1 times forward earnings post-restructuring, compared to 20.3 times in the "base scenario" and regional peer group's average of 23 times. That makes ThaiBev a much more attractive stock for Nirgunan who has a "buy" call and price target of 75 cents. sgx_swinger Thai Bev might fall to 44-45 tomorrow for a good profitable bounce. ThaiBev incurred more than $3b debt in 2012. According to Moody's, Thai Beverage Public Company disclosed 14 August that it received SGD1.35 billion ($1.05 billion) from a capital reduction by Fraser & Neave Limited, in which ThaiBev owns a 28.61% stake. ThaiBev used the full amount of proceeds to reduce SGD1 billion ($779 million) of long-term debt and SGD353 million ($275 million) of short-term debt, a credit positive. Pro forma for the debt reduction, ThaiBev’s adjusted debt to EBITDA declined to 2.8x from 4.2x as of 30 June. We expect ThaiBev will keep its leverage below 3.0x and that it won’t undertake any material additional debt-funded acquisitions over the next 12-18 months. Throughout 2012, ThaiBev incurred more than SGD3.0 billion ($2.3 billion) in debt to assume its F&N stake, stretching its leverage, as measured by adjusted debt to EBITDA, to more than 4x from less than 1x historically. ThaiBev disclosed the capital reduction, which had been expected, in a footnote in its interim financial statement. In May, the board of F&N, a pan-Asian consumer conglomerate, had proposed a capital reduction for a total aggregated amount of SGD4.73 billion ($3.73 billion), to be funded with internal existing cash and equivalents. The distribution accounts for around 85% of the SGD5.59 billion ($4.35 billion) gross sale proceeds of F&N’s interests in Asia Pacific Brewery (unrated). Based on ThaiBev’s 28.61% stake in F&N, this amount translates to SGD1.35 billion ($1.05 billion) of proceeds for ThaiBev. ThaiBev’s deleveraging follows weak earnings in the first half of the year. Year-on-year sales decreased 7.3% owing to sales volume declines across almost all of the company’s product categories, including spirits, beer and soft drinks. The sales volume decline in the alcohol segment largely reflects lower consumption following increased prices for spirits as a result of an increase in excise taxes in Thailand a year ago. The soft drink decline reflects the termination of Sermsuk PLC’s (unrated) bottling contract with PepsiCo, Inc(A1 stable) in Thailand, which ended in November 2012. This is the first year Sermsuk, in which ThaiBev owns a nearly 65% stake, is selling its own brands. ThaiBev’s EBITDA for first half of 2013 also declined by 18% from the same period in 2012 to THB11.9 billion ($3.7 billion), reflecting lower sales, higher marketing expenses and increased wages. We expect marketing expenses will remain high given the competitive beverage market in Thailand as well as the launch of new products by both ThaiBev and competitors. We expect overall sales volumes for ThaiBev, particularly for its beer and soft drinks revenues will likely remain tempered during the second half of the year. However, ThaiBev should still continue to generate stable operating cash flows over the next 12 months from its spirit segment, given its strong domestic market share in that segment. 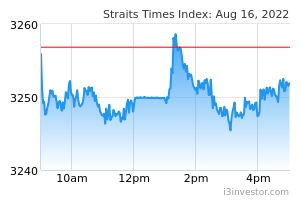 Alex Gray SINGAPORE share prices fell by noon on Tuesday with the Straits Times Index down 21.38 points to 3,063.03. Volume was 1.9 billion shares worth S$489.1 million. Losers outnumbered gainers 270 to 89.
sgx_swinger good call on thai Bev bounce . ticktock buy after pullback at 0.46-0.47? inphyy morning me gave support when price dip base on TA chart. ticktock good for a small run again? ticktock good small run......slow run up to 0.55? inphyy Closing bell 0.500 +0.035. hmmm no latest news on myanmar saga? recently...me hop this ship. Don't think will consider this one soon. ticktock Thai finance ministry will increase excise tax ceiling rates on beer, wine, whiskey and other alcoholic beverages by an average of 7%-8%.......For example, the excise tax for beer is 48%, based on the value (ad-valorem) calculation, while the tax rate for white spirits is only 4%. Both of them are in similar tax brackets in terms of alcohol content per litre (155 and 145 baht per litre). Thai Beverage is the country's largest white spirit producer. barca Last min run up from 0.495 to 0.505....??? Big buy up at closing....got news coming?? soungsoung what is the support for this stock? 0.44?